As a rapidly growing player within the financial sector, JFD Group has emerged into the industry spotlight in recent years for all the right reasons: continuously innovating, this young company has already established itself as a pioneer, standing out among its peers and earning itself an unparalleled reputation as a game-changer. JFD is a global group comprising JFD Brokers, JFD Prime and JFD Wealth, which provide retail electronic trading, prime brokerage and asset management solutions respectively. With offices spanning across Europe and multiple awards to its name, the company, which was launched in December 2011, is now ranked among the top 25 largest electronic brokers and top five largest MT4 brokers worldwide. JFD has achieved remarkable business growth during a relatively short period, earning unrivalled loyalty from its clients and recognition among renowned analysts. It has done this by adopting a radically different position and way of thinking within its field. 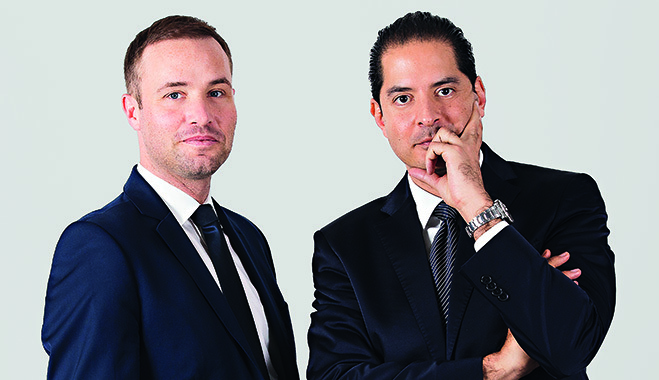 The firm’s long list of accomplishments to date is in large part due to the drive and expertise of its French and German founders, Partner and CEO Cyril Tabet and Partner and COO Lars Gottwik. Spearheading an ambitious team of young professionals and establishing the firm’s overall business and work ethics, our dynamic partnership has helped JFD rise to the top. I personally have been able to bring a strategic vision and in-depth knowledge of the retail electronic brokerage industry to the firm, as well as more than 15 years of hands-on experience with global go-to-market initiatives. Historically, my work has proved instrumental to the success of over 30 high-stake transformation projects that have been implemented across Europe, many of which have been for Global Fortune 500 organisations. More recently, I successfully led the international launches of two of the largest and most recognisable retail forex brands in the world today, Alpari and Interbank FX. My partner, Lars Gottwik, is equally key to our success: he brings to the table unrivalled expertise in financial markets, gained from a decade of professional trading. A former member of BörseGo, one of Germany’s largest financial media networks, his in-depth expertise in forex, futures and stock trading, along with his reputation as a highly respected financial market analyst has acted as the perfect complement to my electronic brokerage experience. We both believe that research is to see what everyone else has seen, but to think what nobody else has thought. With this mentality, we were able to see beyond the work of our competitors and conduct extensive research before we officially launched JFD, gaining a full and thorough understanding of the market. Our ultimate goal is to always provide clients with the best possible service in new and innovative ways. JFD – Just Fair and Direct – bases its operations on a truly win/win scenario, and controls the only large-scale, agency-only business model in the industry. This strategy offers a complete solution suite, providing direct access to the main financial markets as well as to world-class investment products within a completely client-centric environment, without any possible conflict of interest. While retail investors are becoming more knowledgeable and demanding, their access to quality investment services and products remains extremely limited. Reflecting the company’s ‘just fair and direct’ values while taking advantage of the latest available business and technology transformations, the unique model by which JFD operates targets sophisticated retail investors. Irrespective of their trading volumes or investment capacities, the model offers them non-discriminatory, cost-effective and risk-averse access to the financial markets through an array of products and services typically reserved for the private banking sector and hedge fund client-base elite – a clear, industry-wide uniqueness. JFD’s greatest strength resides in its ability to conduct brokerage activity – providing DMA/STP access to 20 Tier1 FX liquidity providers and over 80 exchanges – and extensive asset management activity. As a broker, JFD reduces its end-clients’ trading costs by controlling its proprietary direct market execution venue. As an asset manager, however, JFD eliminates the possibility of incurring any entry, exit, performance or management fees by cutting off any unwanted brokerage intermediaries, instead sourcing direct brokerage revenues from its proprietary asset management activity and so significantly increasing its overall investors’ net annual returns. JFD’s competitiveness in top-end execution, powered by its global proprietary IT infrastructure, allows for overall control of the whole development and delivery chain. In turn, this allows for the delivery of highly optimised brokerage solutions that have been tailored for active investors, as well as systematic strategies tailored for passive investors. Backed by a team of dedicated prime brokerage, private banking, asset management, research, quantitative and IFA professionals who are distributed across Europe and are ready to connect the dots of JFD’s clients’ personal investment objectives, the company prides itself on its successful deployment of one of the most innovative and democratic electronic brokerage and wealth management client-centric solutions within the retail market place. In addition to these achievements, JFD complements its proprietary offering with best-of-breed solutions under an open structure. In effect, the company provides qualified emerging asset managers with a comprehensive kick-starter package: this comprises FCA-based portfolio management umbrella licenses, execution-only services with ultra-low trading costs, multi-account trading tools, and cost-effective access to an array of financial vehicles ranging from managed accounts and German and Swiss-listed Certificates to ETFs and Luxembourg-listed alternative investment funds. This package is backed by unrestricted access to JFD’s proprietary online and offline distribution network, which comprises more than 350 EU-licensed IFAs spread across France, Germany, the UK and Ireland. JFD’s various brands work together, offering a range of intertwined services. The correlation between each branch means that, whenever research is done or accomplishments are achieved in one entity, the other areas also thrive – like a domino effect of success. JFD has caused a real stir in the industry with its low-cost offerings, high-quality service and customisation options. This exceptional service had an impact on the company’s competitors, who used to offer average trading costs within the two pips range on the EUR/USD trade system (versus JFD’s 0.1 to 0.2 pip spread average per 24-hour session, which is the current inter-banking top-of-the-book pricing). What systems have not yet been implemented by JFD’s competitors remains the provision of MiFID-compliant post-trade transparent execution reports, which present the names of the Tier1 banks and non-banks filling clients’ trades. As with JFD, this is how transparency shall be understood and implemented across the sector, and is precisely how JFD believes any retail electronic broker should operate. In addition, JFD prides itself on its ability to protect its clients’ positions and strategies with full anonymity at the inter-banking market level. Unlike with market makers, JFD’s clients’ identities and limit/pending orders are kept 100 percent anonymous in order to minimise the risk of any kind of sensitive information leak. JFD’s headquarters are based in Limassol, Cyprus, the second largest retail online trading hub in Europe. Due to the company’s keen focus on retail investment, its decision to base its operations from this key location was a strategic one, as it also allows JFD to take advantage of the island’s lower operating costs. The company continues to expand across Europe, however, with over 80 employees currently positioned in offices in Germany, France and Bulgaria. The firm has also applied for a banking licence in Germany, which will commence in 2016 if approved. While primary markets are falling across key countries in the European Economic Community – Germany, France, Switzerland and Austria included – JFD’s business continues to expand globally, having now left its footprint in over 60 countries worldwide. The firm made tremendous gains in 2015, generating on average $44bn in trading volumes every month. Furthermore, over 50 percent of all of JFD’s trading clients are still active after three years, an impressive figure when compared to the industry average of just nine weeks. Having acquired numerous awards during its four years of operations, JFD is the youngest and fastest-growing player in the top 25 rankings of electronic brokers worldwide. With a strong strategy that emerged from thorough research and an impressive adoption of progressive technologies within the online trading sphere, this innovative financial firm has earned itself an extensive list of accomplishments and a vast, satisfied client base. With such a solid foundation to build upon, JFD’s commitment to the core values and ideals that its very name represents suggests that the young firm has a very bright future ahead of it.